Leah has pretty much just jumped head first into being a toddler! It’s crazy how different she is now than she was just 3 months ago. First of all, Miss Leah took her first steps at her 1 year doctor’s appointment which was just 3 days after her birthday. The doctor had already left the room, of course, so he didn’t get to witness her milestone. After that, it took her about 2 weeks to really start using walking as her primary mode of getting around. 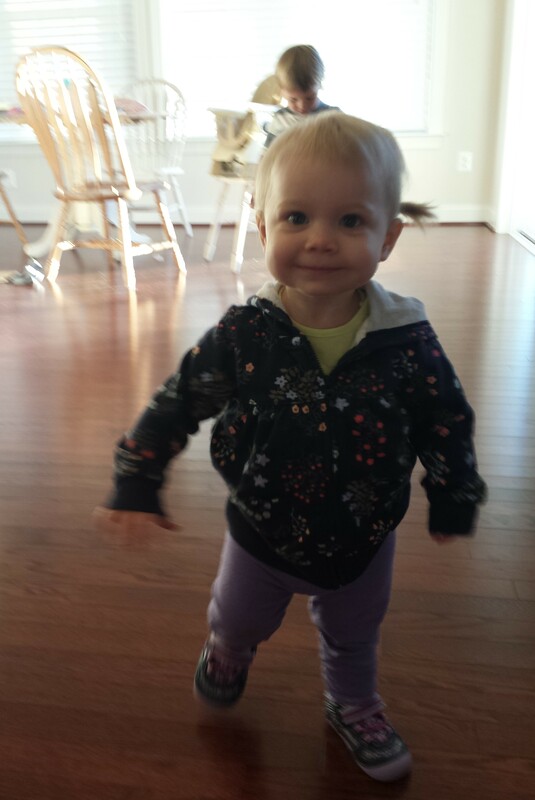 Just shy of 14 months, she started running. She had incentive, of course, in the form of Caelan running off with some toy or something else that Leah wants. She tries as hard as she can to keep up with him and that definitely requires running! 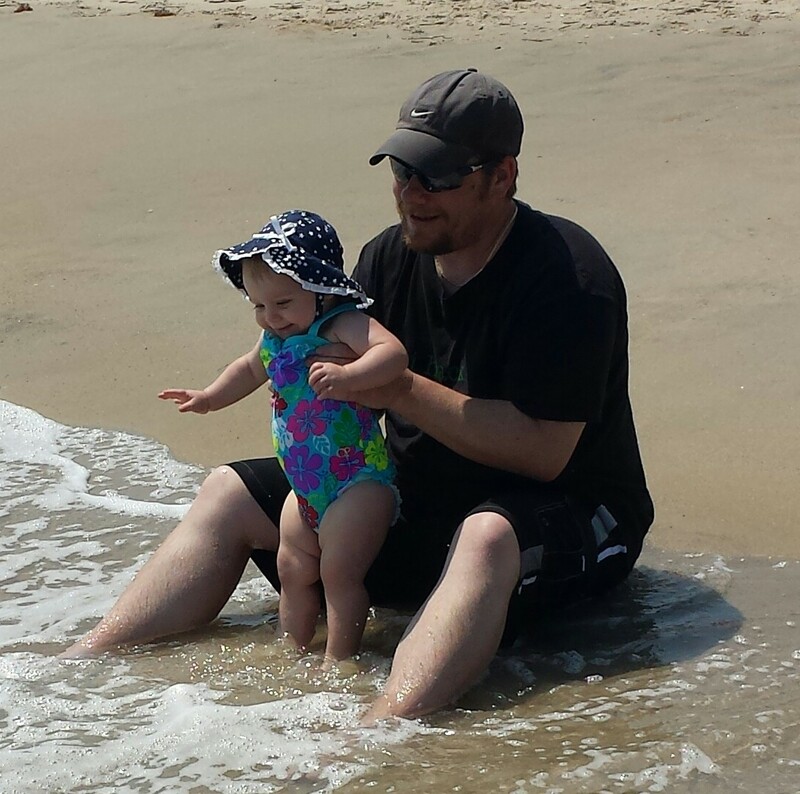 We went on a family beach trip to the Outer Banks a week after Leah’s birthday. 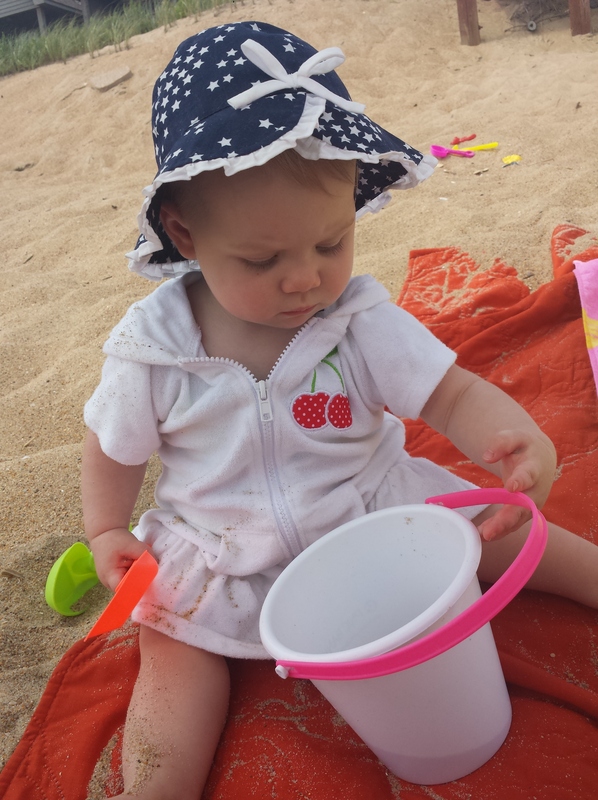 It was her first trip to the beach and she seemed to have a great time. She did the traditional beach napping, plus she also seemed to enjoy playing in the sand and the surf. 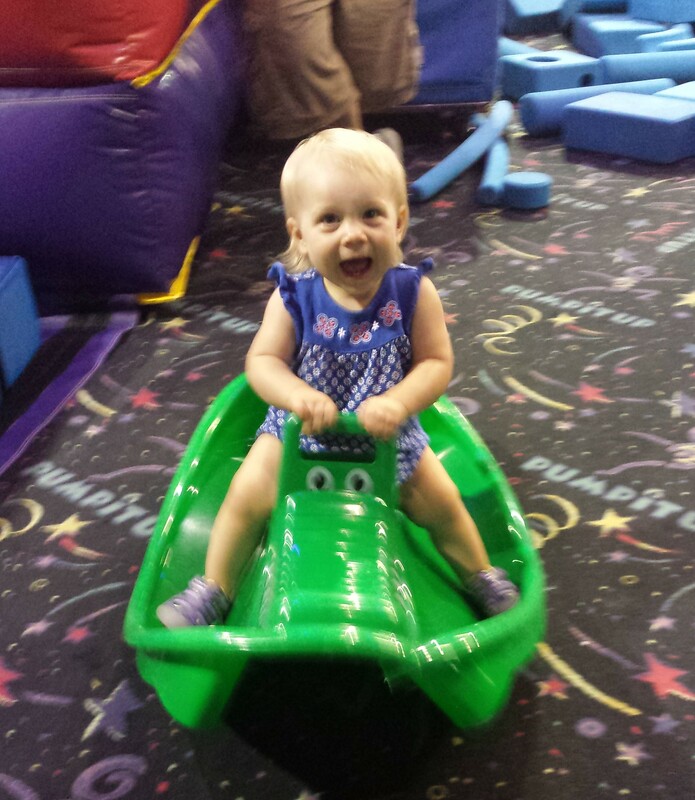 At this age, she was too young to be frightened by any of the above so it was great to see her having fun! The other major milestone in the past 3 months has been her speech. By her first birthday, she had about 3 words that we recognized. Now at 15 months, she has 15: all done, uh oh, hi, up, Dada, again, Jake, more, bye bye, milk, all gone, Connor/Caelan, waffle, paci, and Mama. Notice that Mama was last 🙂 Caelan was the same way – he didn’t say Mama until 15 months as well! She also seems to understand quite a lot. She’s able to follow simple instructions (“sit down”, “come here”, “get your shoes”) and she understands some of the rules we have for her, even if she’s not great at following them. We haven’t really started time out with her yet, but at this point we are usually redirecting her or removing her from certain situations. For example, she loves climbing up onto the hearth, which we allow as long as she sits. If she stands up, she gets kicked off. I remember this phase with Caelan and it takes a loooooonnnngggg time for these rules and consequences to sink in, but they will eventually. Leah will also mimic some of our behaviors including blowing kisses, giving kisses, waving “hello” and “good bye”, giving high fives and fist bumps, and I’ve even seen her grab a bag to put over her arm and then wave and say “bye bye” as if she’s leaving with her purse! She also dances. She LOVES to dance! Leah’s personality is really coming out and she is such a ham. I don’t want to say that she’s “spirited” or “difficult” because I don’t think she is. She just has an older brother who was the poster baby for an easy going baby and compared to him, Leah is a little bit more animated. But she’s a decent sleeper, she plays independently, she is NOT a picky eater at all, and she’s been pretty go-with-the-flow with all the changes in the past few months. But she’s loud and she’s dramatic! If you take something away from her – omg – she will throw herself on the floor and wail. But if you just ignore her she’ll get over herself in a few seconds and go back to whatever she was doing. Sleep habits are ever-changing. For the most part, Leah has been sleeping through the night about 9-10 hours. Occasionally she wakes up and cries but it’s usually just for a minute and then she’s back asleep. Now waking up in the morning has been the tricky part lately. In the past month or 2, she has decided that 5:30am is an awesome time to wake up. I pretty much hate it! For naps, she’s been transitioning (awkwardly) from 2 naps down to 1. 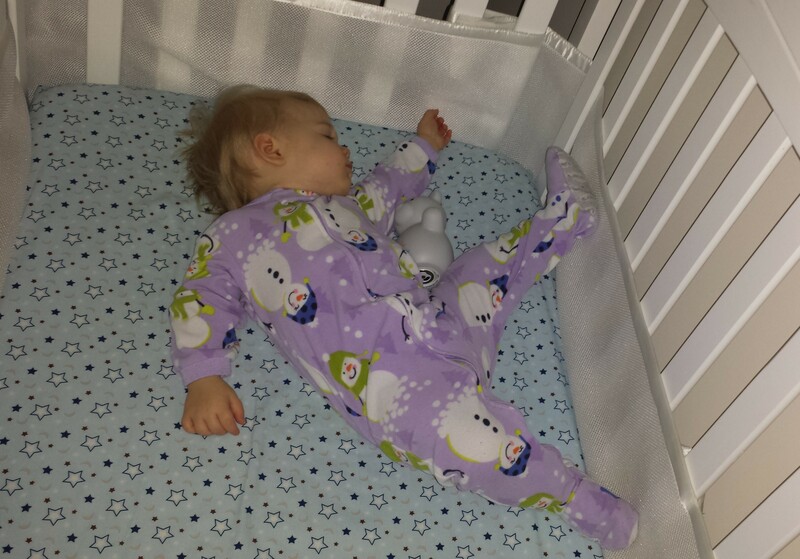 About a month ago, we really tried to push her nap out to after lunch so that she’d be getting 1 substantial mid-day nap. For the most part it worked. She still takes 2 naps occasionally but we try to keep her on the new schedule. And it’s great to put both kids down for 1 nap at the same time. However…Leah is only sleeping about 1.5 hours and Caelan doesn’t sleep at all…Oh well, we’ll take whatever quiet time we can get. It’s been a busy 3 months for teeth! When Leah turned 1 she had only 4 teeth, but now she has 12! They all, especially the molars, just seemed to come in all at once. Honestly, Leah wasn’t as much of a basketcase about the molars as I expected. I didn’t even notice they were coming in until I happened to check one day and 2 were already in! It seems to be those front teeth that really gave her trouble. The last one came in after the molars did and she was back to being a whiny mess for the few days before it came through. Leah is still getting 1 very small bottle a day at bedtime but it’s whole milk, not formula. 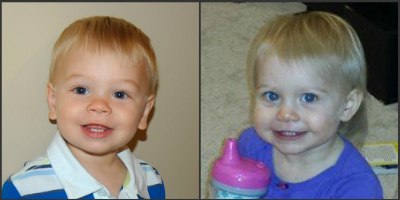 We phased out the formula somewhere between 13 and 14 months. We will probably drop the bedtime bottle in the next few weeks. For meals, Leah eats whatever we’re eating, usually. She’s not picky at all – she seems to love everything! 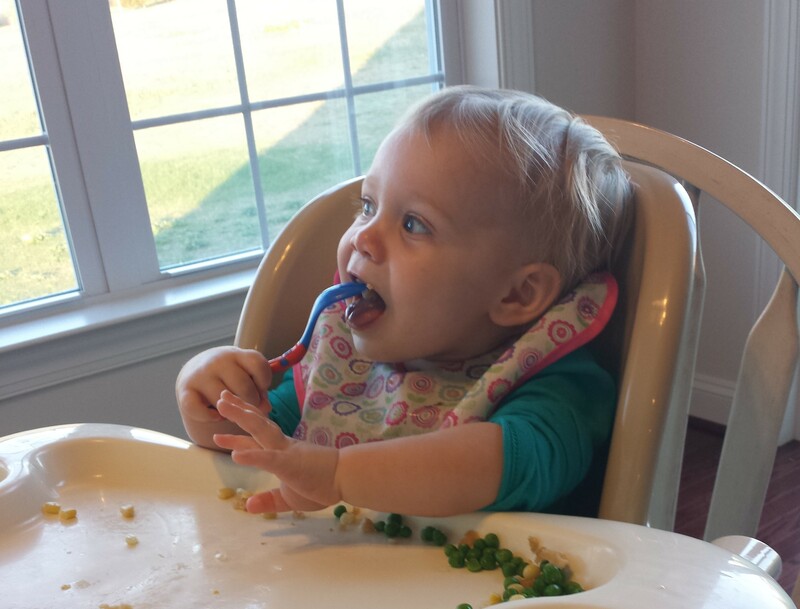 She especially likes peas, grapes, pears, and of course macaroni and cheese. 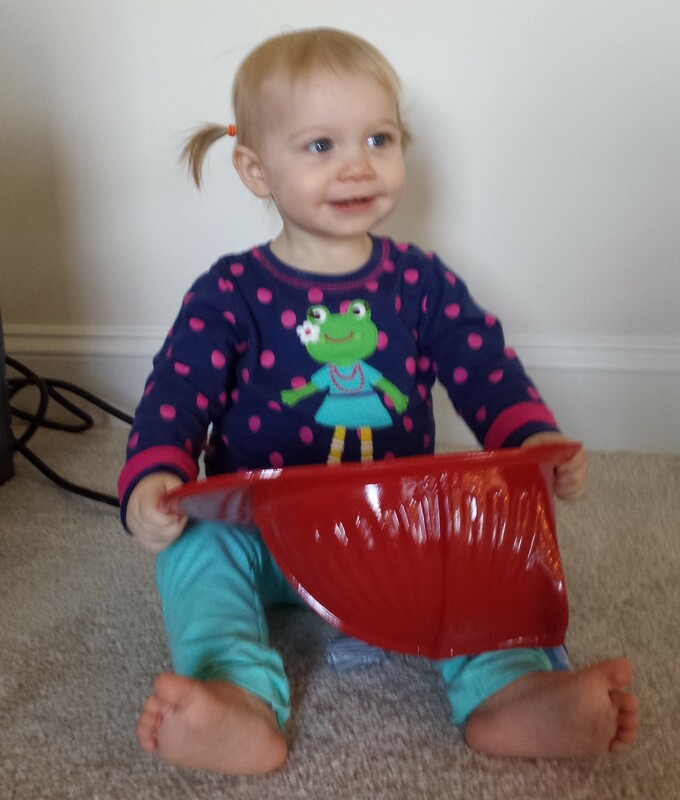 I started giving her a fork/spoon sometimes around 14 months. She had already been using them a bit at daycare and she’s actually not bad with them. But oh man, she’s a messy eater, even without the utensils. Food everywhere. 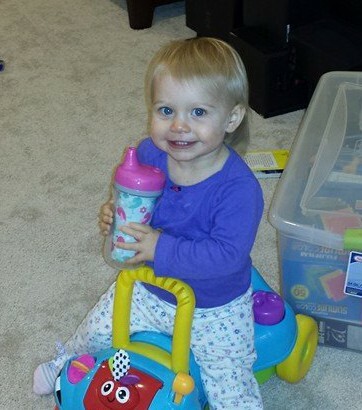 Now that Leah is a real toddler and she can run and play, she and Caelan are having a blast together. There are arguments (shrieking, mostly) over toys, but for the most part, they play well together. Since Leah is still little, we sometimes have to step in and make sure Caelan isn’t accidentally being too rough, but overall it’s really nice to just watch them play together. There are plenty of moments where I get to sit on the couch and watch them call for each other, squeal, run and play together and I think THIS makes it all worth it. 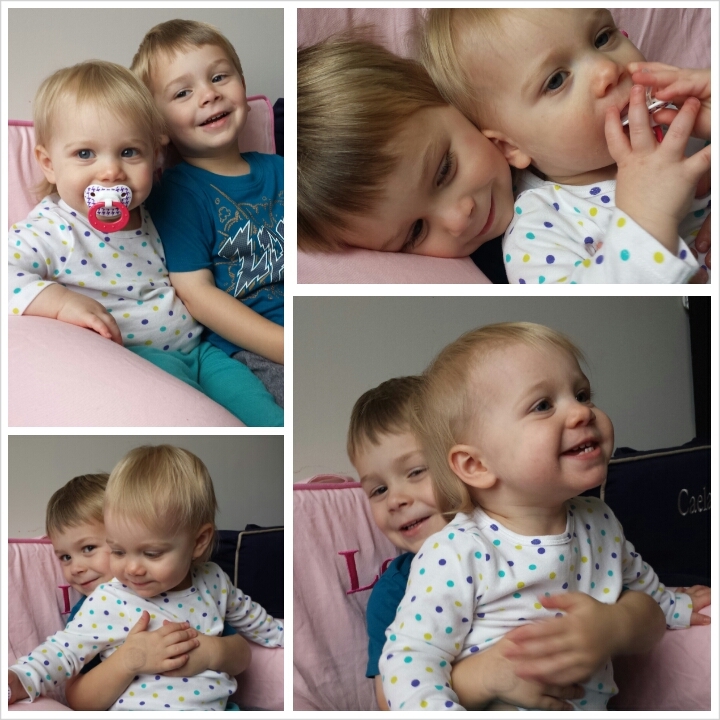 There are plenty of hard parts to having 2 kids, but the good parts are just SO good. These kids have a live-in BFF, how cool is that?! Of course I expect them to fight and have all the normal sibling issues and who knows if they will remain BFF’s forever, but right now they are having a blast. We are pretty firmly moving out of baby territory now. I’ve unloaded most of our baby gear and the kids’ outgrown clothes. We’ve left formula behind us with bottles to follow soon. 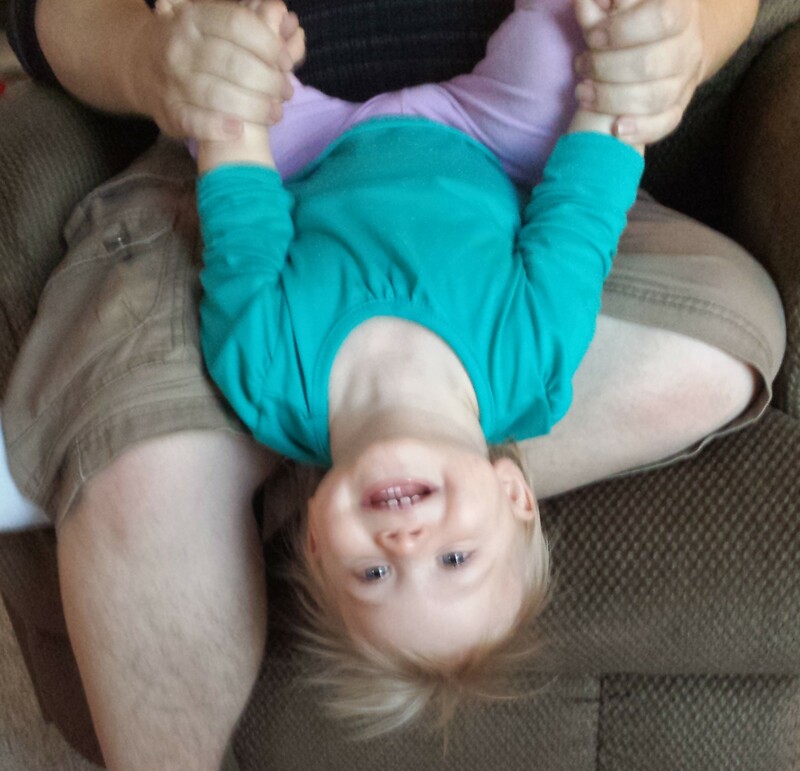 Of course Leah will be in diapers awhile longer, but we’re definitely in toddler territory now. I love this age because it is fascinating and amazing and exciting to watch them learn – and so quickly!! They are little sponges, just soaking up everything around them. It’s also an exhausting age because Leah is old enough to be mobile and to play independently but she’s not old enough to understand limits or know what might be dangerous. We’ve blocked stairs and closed doors to rooms she shouldn’t be in, but otherwise she has free reign on the main level. We kept Caelan on a much tighter leash at this age and we also had a much smaller space. It’s something of a relief to just keep her in ear shot rather than following her every move, but we still have to be careful. Weight: we’ll find out today! Length: we’ll find out today! You are currently browsing the Decorate This blog archives for November, 2014.